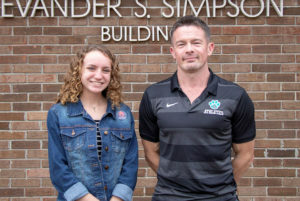 Hayley Whoolery, a junior Cross Country runner at West Johnston High School, was named to the seven-member Fall 2018 All-State Girls Cross Country 1st team by NC Runners. Haley is the only cross country runner from the county awarded with this recognition. Pictured (from left) are Hayley Whoolery and West Johnston High coach Patrich Shaw.